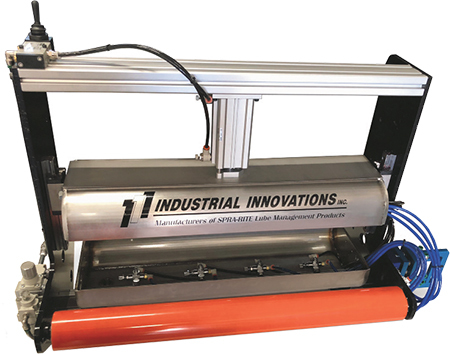 Industrial Innovations highlights its new noncontact Spra-Rite UltraCoat coil-lubricating system, which applies lubricant to stock prior to stamping and helps to improve accuracy and reduce lubricant consumption. The UltraCoat features adjustable flow-controlled spray nozzles and programmable independent fluid control for precise application of the lubricant to the stock, and offers the ability to accommodate low- or high-viscosity lubricants. Because the nozzles are enclosed within a spray box, overspray is reduced and lubricants more easily can be recycled and reused. The system is designed for simple coil-feed installation and provides the ability for communication with a press control. The spray box works with coil stock from 12 to 80 in. wide, and has coil- or power-feed capability.